Grab your flash light and crowbar and feel the adrenaline rush as you join this thieving duo. Try to crack the safe without sounding the alarm. 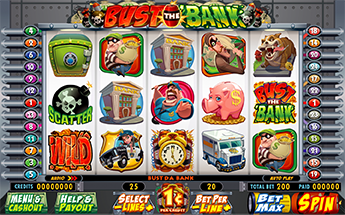 Watch out for the security guard and his trusty watch dog when you make it to the Bust the Bank Bonus! Get ready for easy street in the Free Spins; with reels one and five wild, it’ll be like taking candy from a baby! 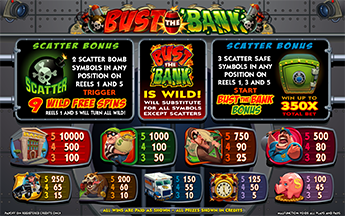 3 Scatter Safe Symbols on reels 1, 3 & 5 trigger the Bust the Bank Bonus. Keep picking from 9 safes until Buster, the cop dog, is revealed. Win up to 350x total bet. 2 Scatter Bomb Symbols anywhere on reels 1 and 5 trigger 9 Wild Free Spins. During Free Spins, reels 1 & 5 turn wild..